Caught on CCTV: volunteers from Leith Open Space in Persevere Community Garden. “You’ve been working hard,” commented the concierge when we went to return the key to the walled garden. He’d been watching us on the screen. This is a challenging piece of ground. 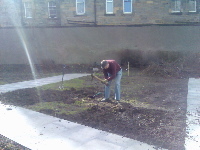 After two hours of heavy digging with spade, fork and mattock (that’s the evil looking object you can see in the corner), we had covered one third of the plot we are sharing with Greener Leith. In that time we dug up several empty bottles and cans, a huge concrete block, lots of stones and two very optimistic worms (or was that the same worm twice?). There’s lots of hard work going on. Congratulations to Greener Leith volunteers who have been hard at work since the opening – most of the spiky berberis bushes round the edge of the garden have been cleared away. 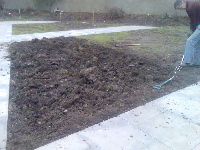 Persevere Community Flat have got their plot dug already. And there are buds on all our fruit trees! Previous Previous post: Onwards, upwards and outwards?